The Eiffel Tower in Paris, as seen from the esplanade du Trocadéro. ¹ French Land Register data, which excludes lakes, ponds, glaciers > 1 km² (0.386 sq mi or 247 acres) and river estuaries. Paris is the capital city of France, situated on the River Seine, in northern France, at the heart of the Île-de-France region ("Région parisienne"). The Paris "aire urbaine" (roughly: "metropolitan area") is one of the most populated areas of its kind in Europe, with a population of roughly 12 million, including 10 million in the Paris urban area, plus the population of the commuter belt surrounding it. Paris has a population of a little over 2 million within city limits. An important settlement for more than two millennia, its location at a crossroads between land and river trade routes in lands of abundant agriculture had made it one of the principal cities of France by the tenth century, endowed with royal palaces, wealthy abbeys and a cathedral; by the twelfth century Paris had become one of Europe's foremost centers of learning and the arts. During the last nine hundred years Paris was the center of important Western philosophical and political developments: the University of Paris was home to many major medieval philosophers and early scientists; Paris was the site of the French Revolution; and its rich cultural milieu and wealthy patrons provided an intellectual environment in which innovative artists and thinkers flourished. Today Paris is one of the world's leading business and cultural centers, and its influence in politics, education, entertainment, media, business, fashion and the arts all contribute to its status as one of the major global cities, along with London, New York, and Tokyo. Today, the city serves as an important hub of intercontinental transportation and is home to universities, sport events, opera companies, and museums of international renown, making it the most popular tourist destination in the world with over 30 million foreign visitors per year. The name Paris, pronounced [ˈpærɪs] in English and [paʀi] in French, derives from that of its pre-Roman-era inhabitants, the Gaulish tribe known as the Parisii. The city was called Lutetia (/lutetja/) during the first- to sixth-century Roman occupation, but the present name began to take hold towards the end of that period. Paris has many nicknames, but its most famous is 'The City of Light' (La Ville-lumière), a name it owes both to its fame as a centre of education and ideas and its early adoption of street-lighting. Paris since the early twentieth century has also been known in Parisian slang as Paname ([panam]; (Moi j'suis d'Paname, "I'm from Paname"), a slang name that has been regaining favor with young people in recent years. Paris's inhabitants are known in English as "Parisians" ([pʰəˈɹɪzɪənz] or [pʰəˈɹiːʒn̩z]) and as Parisiens in French. Parisians are often pejoratively called Parigots ([paʀigo]) by those living outside the Paris Region, but this is a term sometimes considered endearing by Parisians themselves. The earliest signs of permanent habitation in the Paris area date from around 4200 B.C.E. Known as boatsmen and traders, a sub-tribe of the Celtic Senones, the Parisii, settled the area near the river Seine from around B.C.E. The Roman westward campaigns had conquered the Paris basin in 52 B.C.E. A permanent Roman settlement began towards the end of the same century on Paris' Rive Gauche (Left Bank), Sainte Geneviève Hill and Île de la Cité island. The Gallo-Roman town, first called Lutetia, but later becoming Gallicised Lutèce, expanded greatly over the following centuries, becoming a prosperous city with palaces, a forum, baths, temples, theatres, and an amphitheatre. The collapse of the Roman Empire and third-century Germanic invasions sent the city into a period of decline: by 400 C.E. Lutèce, largely abandoned by its inhabitants, was little more than a garrison town entrenched on its hastily fortified central island. The city reclaimed its original "Paris" appellation towards the end of the Roman occupation. 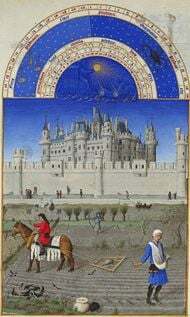 View of the Louvre castle from the fifteenth century Très Riches Heures du Duc de Berry. Around 500 C.E., Paris was the capital of the Frankish king Clovis I, who commissioned the first cathedral and its first abbey dedicated to his contemporary, later patron saint of the city, Sainte Geneviève. On the death of Clovis, the Frankish kingdom was divided, and Paris became the capital of a much smaller sovereign state. By the time of the Carolingian dynasty in the ninth century, Paris was little more than a feudal county stronghold. The Counts of Paris gradually rose to prominence and eventually wielded greater power than the Kings of Francia occidentalis. Odo, Count of Paris was elected king in place of the incumbent Charles the Fat, because of the fame he acquired in his defense of Paris during the Viking siege (Siege of Paris, 885-886). Although the Cité island had survived the Viking attacks, most of the city on the unprotected Rive Gauche (Left Bank) was destroyed; rather than rebuild there, after drying marshlands to the north of the island, Paris began to expand onto the Rive Droite (Right Bank). In 987 C.E., Hugh Capet, Count of Paris, was elected King of France, founding the Capetian dynasty which raised Paris to become France's capital. From 1190, King Philip II of France (Philip Augustus) enclosed Paris on both banks by building a wall with the Louvre as its western fortress. In 1200 he chartered the University of Paris which attracted scholars and visitors from across Europe. During this period the city developed a spatial distribution of activities that can still be seen today: the central island housed government and ecclesiastical institutions, the left bank became a scholastic centre with the University and colleges, while the right bank developed as the centre of commerce and trade around the central Les Halles marketplace. While occupied by the English-allied Burgundians during the Hundred Years' War, Paris lost its position as seat of the French realm, but regained its title when Charles VII of France reclaimed the city in 1437. Although Paris was once again the capital, the Crown preferred to remain in its Loire Valley castles. Paris was a stronghold of the Catholic League, during the French Wars of Religion, which culminating in the St. Bartholomew's Day massacre (1572). After capturing the city from the Catholic party, King Henry IV of France re-established the royal court in Paris in 1594. During the “Fronde,” (1648–1653) Parisians rose in rebellion and the royal family fled the city King Louis XIV of France moved the royal court permanently to Versailles in 1682. A century later, Paris became the center of the French Revolution, with the Storming of the Bastille in 1789 and the overthrow of the monarchy in 1792. Gare du Nord, a symbol of the Industrial Revolution. - Train stations have often been called the cathedrals of the nineteenth century. The Industrial Revolution, the French Second Empire, and the Belle Époque brought Paris the greatest development in its history. From the 1840s, rail transport allowed an unprecedented flow of migrants into Paris, attracted by employment in the new industries in the suburbs. The city underwent a massive renovation under Napoleon III and his préfet Baron Haussmann, who leveled entire districts of narrow, winding medieval streets to create the network of wide avenues and neo-classical façades of modern Paris, with the added incentive that in case of future revolts or revolutions, artillery and rifles could now be utilized efficiently to control crowds. Cholera epidemics in 1832 and 1849 affected the population of Paris—the 1832 epidemic alone claimed 20,000 of the then population of 650,000. Paris also suffered greatly from the Siege of Paris which ended the Franco-Prussian War (1870-1871), and the ensuing civil war (Commune of Paris, 1871) killed thousands and sent many of Paris's administrative centers (and city archives) up in flames. Paris recovered from these events to host the famous Universal Expositions of the late nineteenth century. The Eiffel Tower was built for the French Revolution centennial Exposition Universelle (1889), as a "temporary" display of architectural engineering prowess, but remained the world's tallest building until 1930, and is the city's best-known landmark. The first line of the Paris Métro opened for the [[Exposition Universelle (1900) and was an attraction in itself for visitors from the world over. Paris's World's Fairs helped to establish the city as a tourist destination and an attractive setting for international technology and trade shows. 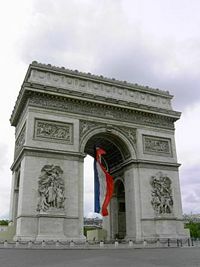 During World War I, Paris was at the forefront of the war effort, having been spared from German invasion by the French and British victory at the First Battle of the Marne in 1914. In 1918-1919, it was the scene of Allied victory parades and peace negotiations. In the period between the World Wars, Paris was famed for its cultural and artistic communities and its nightlife. The city became a gathering place for artists from around the world, from exiled Russian composer Stravinsky and Spanish painters Picasso and Dalí to American writer Hemingway. In June 1940, five weeks after the start of the German attack on France, Paris fell to German Nazi occupation forces that remained there until the city was liberated by the Allies in August of 1944. After the Normandy invasion, Paris waited for liberation. Central Paris endured World War II practically unscathed, as it contained no strategic targets for bombers; the train stations in central Paris are terminal stations, and major factories were located in the suburbs. German General von Choltitz refused to carry out Hitler's order that all Parisian monuments be destroyed before any German retreat. During the post-war era, Paris experienced its largest development since the end of the Belle Époque in 1914. The suburbs began to expand considerably, with the construction of large social estates known as cités and the beginning of the business district “La Défense.” A comprehensive express subway network, the RER, was built to complement the Métro and serve the distant suburbs, while a network of freeways was developed in the suburbs, centered on the Périphérique expressway circling around the city. Since the 1970s, many inner suburbs of Paris (especially the eastern ones) have experienced deindustrialization, and the once-thriving cités have gradually become ghettos for immigrants and oases of unemployment. At the same time, the City of Paris (within the Périphérique ring) and the western and southern suburbs have successfully shifted their economic base from traditional manufacturing to high value-added services and high-tech manufacturing, generating great wealth for their residents, whose per capita income is among the highest in Europe. The widening social gap between these two areas has led to periodic unrest since the mid-1980s, such as the 2005 riots which were largely concentrated in the northeastern suburbs. View from the top of the Eiffel tower, looking north. Paris is located on a north-bending arc of the River Seine and includes two islands, the Île Saint-Louis and the larger Île de la Cité which forms the oldest part of the city. Paris has several prominent hills, of which the highest is Montmartre at 130 metres (426 ft) above sea level. Paris, excluding the outlying parks of Bois de Boulogne and Bois de Vincennes, covers an oval measuring 86.928 square kilometres (33.56 mi²) in area. The city's last major annexation of outlying territories in 1860 not only gave it its modern form, but created the twenty clockwise-spiraling arrondissements (municipal boroughs). From its 1860 78 km² (30.1 mi²), these limits expanded marginally to 86.9 km² in the 1920s, and in 1929 the Bois de Boulogne and Bois de Vincennes forest parks were officially annexed to the city, bringing its area to its present 105.397 square kilometres (40.69 mi²). The Paris metropolitan area extends far beyond the city limits, forming an irregular oval with arms of urban growth extending along the Seine and Marne rivers from the city's south-east and east, and along the Seine and Oise rivers to the city's north-west and north. Further, beyond the central suburbs, population density drops sharply in the surrounding land; a mix of forest and agriculture dotted with a network of relatively evenly dispersed satellite towns, this commuter belt, when combined with the Paris agglomeration, completes a Paris aire urbaine (metropolitan area) that covers an oval 14,518 km² (5,605.5 mi²) in area, or about 138 times that of Paris itself. Paris has an oceanic climate and is affected by the North Atlantic Drift, so the city has a temperate climate that rarely sees extremely high or low temperatures. The overall climate throughout the year is mild and moderately wet. Summer days are usually warm and pleasant with average temperatures hovering between 15 and 25 °C (59 and 77 °F), and a fair amount of sunshine. Each year, however, there are a few days where the temperature rises above 32 °C (90 °F). The Paris region has recently seen temperatures reaching both extremes, with the European heat wave of 2003 and the European cold wave of 2006. Spring and autumn have, on average, mild days and fresh nights but are changing and unstable. Surprisingly warm or cool weather occurs frequently in both seasons. In winter, sunshine is scarce; days are cool, nights cold but generally above freezing with low temperatures around 3 °C (37 °F). Light night frosts are however quite common, but the temperature will dip below −5 °C (23 °F) for only a few days a year. Snow falls every year, but rarely stays on the ground. The city sometimes sees light snow or flurries with or without accumulation. Paris has an average annual precipitation of 652 mm (25.7 in), and experiences light rainfall distributed evenly throughout the year. However the city is known for intermittent abrupt heavy showers. "Modern" Paris is the result of a vast mid-nineteenth-century urban remodelling. 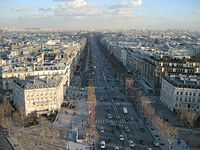 For centuries it had been a labyrinth of narrow streets and half-timber houses, but beginning in 1852, the Baron Haussmann's vast urbanization leveled entire quarters to make way for wide avenues lined with neo-classical stone buildings of bourgeoise standing; most of this 'new' Paris is the Paris we see today. These Second Empire plans are in many cases still actual, as the city of Paris imposes the "alignement" law of that time (imposed position defining a predetermined street width) on many new constructions. 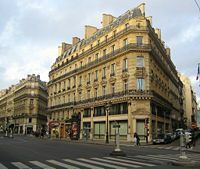 A building's height was also defined according to the width of the street it lines, and Paris' building code has seen few changes since the mid-nineteenth century to allow for higher constructions. For this reason, Paris is mainly a "flat" city. Paris' unchanging borders, strict building codes and lack of developable land have together contributed in creating a phenomenon called muséification (or "museumification") as, at the same time as they strive to preserve Paris' historical past, existing laws make it difficult to create the larger buildings and utilities needed for a growing population within city limits. Many of Paris' institutions and economic infrastructure are already located in, or are planning on moving to, the suburbs. The financial (La Défense) business district, the main food wholesale market (Marché d'Intérêt National de Rungis), major renowned schools (École Polytechnique, École des Hautes Études Commerciales, ESSEC, INSEAD, etc. ), world famous research laboratories (in Saclay or Évry), the largest sport stadium (Stade de France), and some ministries (namely the Ministry of Transportation) are located outside of the city of Paris. The National Archives of France are due to relocate to the northern suburbs before 2010. Place de la Concorde (8th arrondissement, right bank) is at the foot of the Champs-Élysées, built as the "Place Louis XV," site of the infamous guillotine. The Egyptian obelisk is Paris's "oldest monument." On the two sides of the Rue Royale, stand two identical stone buildings: the eastern houses the French Naval Ministry, the western the luxurious Hôtel de Crillon. Nearby Place Vendôme is famous for its fashionable and deluxe hotels (Hotel Ritz and Hôtel de Vendôme) and its jewellers. Many famous fashion designers have had their salons in the square. L'Opéra (9th arrondissement, right bank), the area around the Opéra Garnier, is home to the capital's densest concentration of both department stores and offices. A few examples are the Printemps and Galeries Lafayette grands magasins (department stores), and the Paris headquarters of financial giants such as Crédit Lyonnais and American Express. Les Halles (1st arrondissement, right bank) was formerly Paris' central meat and produce market; since the late 1970s it has been a major shopping center around an important metro connection station (the biggest in Europe). The previous Les Halles was destroyed in 1971 and replaced by the Forum des Halles. The central market of Paris, the biggest wholesale food market in the world, was transferred to Marché d'Intérêt National de Rungis, in the southern suburbs. Le Marais (3rd and 4th arrondissements) is a trendy and culturally diverse district on the Right Bank district. Place de la Bastille (4th, 11th and 12th arrondissements, right bank) is one of the most historic districts, being the site of an event that changed the history, not only of Paris, but the whole country of France. Because of its historical value, the square is often used for political demonstrations, including the massive labor protests of March 28, 2006. Quartier Latin (5th and 6th arrondissements, left bank) is a twelfth-century scholastic center formerly stretching between the Left Bank's Place Maubert and the University of Paris (Sorbonne) campus. It is known for its lively atmosphere and many bistros. Various institutions of higher education, such as the École Normale Supérieure, ParisTech and the Jussieu university campus, make it a major educational center in Paris, and contribute to its atmosphere. La Défense (straddling the communes of Courbevoie, Puteaux, and Nanterre, 2.5 km/1.5 miles west of the City of Paris) is a key suburb of Paris and is one of the largest business centers in the world. Built at the western end of a westward extension of Paris' historical axis from the Champs-Élysées, La Défense consists mainly of business high-rise buildings. Initiated by the French government in 1958, the district hosts 3.5 million m² of offices, making it the largest district in Europe specifically developed for business. The Grande Arche (Great Arch) of la Défense, which houses a part of the headquarters of the French Transport Minister, ends the central Esplanade around which the district is organized. The Axe historique (Historical Axis) is a line of monuments, buildings and thoroughfares that run in a roughly straight line from the city centre westwards: the line of monuments begins with the Louvre and continues through the Tuileries Gardens, the Champs-Élysées and the Arc de Triomphe centered in the Place de l'Étoile circus. From the 1960s the line was prolonged even further west to the La Défense business district dominated by a square-shaped triumphal Grande Arche of its own; this district hosts most of the tallest skyscrapers in the Paris urban area. The Invalides museum is the burial place for many great French soldiers, including Napoleon, and the Panthéon church is where many of France's illustrious men and women are buried. The former Conciergerie prison held some prominent ancien régime members before their deaths during the French Revolution. 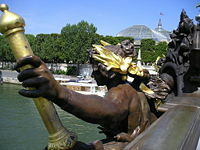 Another symbol of the Revolution are the two Statues of Liberty located on the Île des Cygnes on the Seine and in the Luxembourg Garden. A larger version of the statues was sent as a gift from France to America in 1886 and now stands in New York City's harbor. The Palais Garnier, built in the later Second Empire period, houses the Paris Opera and the Paris Opera Ballet, while the former palace of the Louvre now houses one of the most famous art museums in the world. The Sorbonne is the most famous part of the University of Paris and is based in the centre of the Latin Quarter. Apart from Notre Dame de Paris, there are several other ecclesiastical masterpieces including the Gothic thirteenth century Sainte-Chapelle palace chapel and the Église de la Madeleine. Two of Paris's oldest and famous gardens are the Tuileries Garden, created from the sixteenth century for a palace on the banks of the Seine near the Louvre, and the Left Bank Luxembourg Garden, another formerly private garden belonging to a château built for Marie de' Medici in 1612. The Jardin des Plantes, created by Louis XIII's doctor Guy de La Brosse for the cultivation of medicinal plants, was Paris' first public garden. A few of Paris' other large gardens are Second Empire creations: the formerly suburban parks of Montsouris, Parc des Buttes Chaumont and Parc Monceau (formerly known as the "folie de Chartres"), were creations of Napoleon III's engineer Jean-Charles Alphand. You will often see Parisians having picnics at the parks, soaking up the warm sunshine, or simply enjoying nature. They are peaceful escapes from the city and are enjoyed by all ages. Another project executed under the orders of Baron Haussmann was the re-sculpting of Paris' western Bois de Boulogne forest-parklands; the Bois de Vincennes, to Paris' opposite eastern end, received a similar treatment in years following. Newer additions to Paris' park landscape are the Parc de la Villette, built by the architect Bernard Tschumi on the location of Paris' former slaughterhouses, and gardens being laid to Paris' periphery along the traces of its former circular Petite Ceinture" railway line. 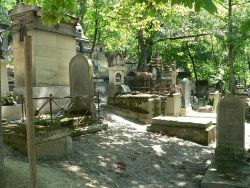 Paris' cemeteries were on located on its outskirts in 1804. Many of Paris' churches each had their own cemetery, but, by the late eighteenth century, these were creating unpleasant living conditions for nearby residential areas. All parish cemeteries were abolished from 1786, and their contents were taken to abandoned limestone mines outside the southern gates of Paris, today the 14e arrondissement's place Denfert-Rochereau. They are known today as the Paris Catacombes. New suburban cemeteries were created in the early twentieth century: the largest of these are the Cimetière Parisien de Saint-Ouen, the Cimetière Parisien de Bobigny-Pantin, the Cimetière Parisien d'Ivry and the Cimetière Parisien de Bagneux. 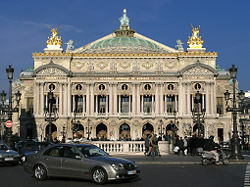 Paris' largest opera houses are the nineteenth-century Opéra Garnier and modern Opéra Bastille; the former tends towards the more classic ballets and operas, and the latter provides a mixed repertoire of classic and modern. Theatre traditionally has had a large place in Parisian culture. This still holds true, although today many of its most popular actors today are also stars of French television. A few of Paris' major theaters are Bobino, Théâtre Mogador and the Théâtre de la Gaîté-Montparnasse. Some Parisian theaters also doubled as concert halls. Many of France's greatest musical legends such as Édith Piaf, Maurice Chevalier, Georges Brassens and Charles Aznavour found their fame in Parisian concert halls: legendary examples of these which are still in existence are Bobino, l'Olympia, la Cigale and le Splendid. The Élysées-Montmartre, much reduced from its original size, is a concert hall today. The New Morning is one of few Parisian clubs still holding jazz concerts, but also specializes in 'indie' music. More recently, the Zenith hall in Paris' La Villette quarter and a "parc-omnisports" stadium in Bercy serve as large-scale rock concert halls. Like many of the world’s city-dwellers, Parisians movie-goers favor Hollywood-generated film entertainment. French cinema comes a close second, with major directors (réalisateurs) such as Claude Lelouch, Jean-Luc Godard, Claude Chabrol and Luc Besson, and the more slapstick/popular genre with director Claude Zidi as an example. European and Asian films are also widely shown and appreciated. A specialty of Paris is its very large network of small movie theaters: during any week the movie fan has a choice of approximately three hundred old and new movies from all over the world. Many of Paris' concert and dance halls were transformed into movie theatres when the media became popular starting in the 1930s. Later most of the largest cinemas were divided into multiple, smaller rooms: Paris' largest cinema today is by far le Grand Rex theater with 2800 seats, while other cinemas all have less than 1000 seats. There is now a trend toward modern multiplexes with more than 10 or 20 screens in the same building. 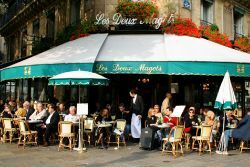 Front view of Les Deux Magots; one of the most famous Parisian cafés, in Saint-Germain-des-Prés. 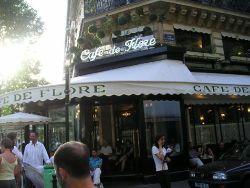 Le Café de Flore, another famous Parisian café, in Saint-Germain-des-Prés. With the opening of the café Régence at the Palais Royal in 1688, and the left bank Café Procope one year later, cafés quickly became an integral part of French culture. The cafés in the gardens of the Palais Royal became quite popular through the eighteenth-century, and can be considered Paris' first "terrace cafés;" these became widespread when sidewalks and boulevards began to appear in the mid-nineteenth century. Cafés are an almost obligatory stop on the way to or from work for many Parisians, and especially during lunchtime. Paris' culinary reputation has its base in the many origins of its inhabitants. With the early-nineteenth-century railways and ensuing industrial revolution came a flood of migration that brought to Paris all the gastronomical diversity of France's many different regions, maintained through 'local specialty' restaurants catering to the tastes of people from each region. "Chez Jenny" is a typical example of a restaurant specializing in the cuisine of the Alsace region, and "Aux Lyonnais" is another with traditional fare originating from the region of Lyons. Immigration from foreign countries meant an even greater culinary diversity, and today, in addition to a great number of North African and Asian establishments, one can find top-quality cuisine from virtually the world over in Paris. Hotels were another result of widespread travel and tourism, especially Paris' late-nineteenth century Expositions Universelles (World's Fairs). Of the most luxurious of these, the Hôtel Ritz appeared in the Place Vendôme from 1898, and the Hôtel de Crillon opened its doors on the north side of the place de la Concorde in 1909. Paris had always been a destination for traders, students and those on religious pilgrimages, but its 'tourism' began on a large scale only with the appearance of rail travel, when the government began organizing France's rail network in 1848. Paris' first 'mass' attractions, drawing international attention, were the Expositions Universelles, the first of which was held in 1855, and which inspired the construction of many new monuments, such as the Eiffel tower (1889). These Expositions, in addition to the Capital's Second Empire embellishments, did much to make the city into the attraction it is today. Paris' museums and monuments are its most sought-after attractions, and increasing tourism has motivated both city and State to create new ones. The city's most prized museum, the Louvre, has over 6 million visitors a year. Paris' cathedrals are another main attraction: its Notre-Dame cathedral and Sacré-Coeur basilica annually receive 12 million and eight million visitors respectively. 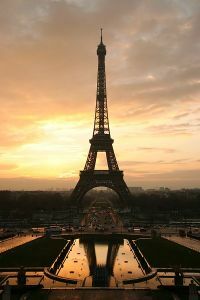 The Eiffel Tower, by far Paris' most famous monument, averages over 6 million visitors per year. Disneyland Resort Paris is a major tourist attraction, not only for visitors to Paris, but for Parisians themselves, with 12.4 million visitors in 2004. 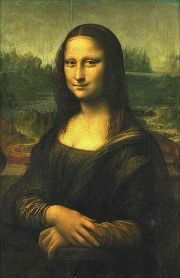 The Mona Lisa, one of the Louvre's most famous treasures. 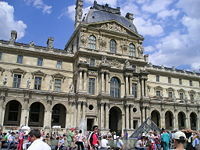 The Louvre is one of the largest and most famous museums, housing many works of art, including the Mona Lisa (La Joconde) and the Venus de Milo statue. Works by Pablo Picasso and Rodin are found in Musée Picasso and Musée Rodin, and the artistic community of Montparnasse]] is chronicled at the Musée du Montparnasse. Starkly apparent with its service-pipe exterior, the Centre Georges Pompidou, also known as Beaubourg, houses the Musée National d'Art Moderne. Art and artifacts from the Middle Ages, including the tapestry cycle The Lady and the Unicorn, are kept in Musée Cluny; and art from the Impressionist era is housed in the Musée d'Orsay. Many of Paris' hotel, restaurant and nighttime entertainment businesses have become heavily dependent on tourism, with sometimes detrimental results for Parisian culture. Many of Paris' once-popular local establishments have metamorphosed into a parody of French culture, in a form that caters to the tastes and expectations of foreign tourists. The Moulin Rouge cabaret-dancehall, for example, has become the site of a staged dinner theater spectacle with a dance display that was only one aspect of the cabaret's former atmosphere. All of the establishment's former social or cultural elements, such as its ballrooms and gardens, are gone today. Paris's main sport clubs are the football club Paris Saint-Germain, the basketball team Paris Basket Racing and the rugby union club Stade Français Paris. The 80,000-seat Stade de France was built for the 1998 FIFA World Cup and is used for football and rugby union, and is used annually for French rugby team's home matches of the Six Nations Championship and sometimes for big matches for the Stade Français rugby team. Racing Métro 92 Paris (who now play in Rugby Pro D2) is another rugby team, which actually contested the first ever final against Stade Français in 1892. Paris also hosted the 1900 and 1924 Olympic Games, and was venue for the 1938 and 1998 FIFA World Cups. Although the starting point and the route of the famous Tour de France varies each year, the final stage always finishes in Paris and since 1975, the race has finished on the Champs-Elysées. Tennis is another popular sport in Paris and throughout France. The French Open, held every year on the red clay of the Roland Garros National Tennis Center near the Bois de Boulogne, is one of the four Grand Slam events of the world professional tennis tour. The 2006 UEFA Champions League Final between Arsenal and FC Barcelona was played in the Stade de France. Paris hosted the 2007 Rugby World Cup final at Stade de France. The Paris region (Île-de-France) is France's foremost centre of economic activity. With La Défense, the largest purpose-built business district in Europe, it hosts the head offices of almost half of the major French companies, as well as the headquarters of ten of the world's one hudnred largest companies. Paris is also considered to be the capital of the (EMEA) region (Europe, the Middle East and Africa) with more EMEA headquarters than any other European city. Paris also hosts many international organizations such as UNESCO, the OECD, the ICC, and the informal Paris Club. The Paris region has one of the highest GDPs in Europe, making it an engine of the global economy. The Paris Region is France's premier centre of economic activity. In recent decades, the Paris economy has been shifting towards high value-added service industries such as finance, and IT services; and high-tech manufacturing such as electronics, optics, and the aerospace industry. The Paris Region's most intense economic activity is in the central Hauts-de-Seine département]] and suburban La Défense business districts, placing Paris' economic center to the west of the city, in a triangle between the Opéra Garnier, La Défense and the Val de Seine. Paris' administrative borders have little effect on its economic activity: although most workers commute from the suburbs to work in the city, many commute from the city to work in the suburbs. According to 2012 INSEE figures, 68 percent of employees in the City of Paris work in commerce, transportation, and services; 24.4 percent in public administration, health and social services; 4.4 percent in industry, and 0.1 percent in agriculture. The population of the city of Paris was 2,125,246 at the 1999 census, lower than its historical peak of 2.9 million in 1921. The city's population loss mirrors the experience of most other core cities in the developed world that have not expanded their boundaries. The principal factors contributing to the loss of population were a significant decline in household size, and a dramatic movement of residents to the suburbs between 1962 and 1975. The movement to the suburbs was motivated by de-industrialization, high rent, the gentrification of many inner quarters, the transformation of living space into offices, and greater affluence among working families. Paris’s population loss was one of the most severe among international municipalities and the largest for any that had achieved more than 2,000,000 residents. The city's population loss came to an end in the twenty-first century; the population estimate of July 2004 showed a population increase for the first time since 1954, and the population is now over 2.2 million. Paris is the most densely populated city of more than 1,000,000 in the Western world. Its population density, excluding the outlying woodland parks of Boulogne and Vincennes, was 24,448 inh. per km² (63,321 inh. per sq. mile) in 1999 official census. Even including the two woodland areas its population density was 20,164 / km² (52,224 / sq mi), the fifth most densely populated commune in France following Le Pré-Saint-Gervais, Vincennes, Levallois-Perret, and Saint-Mandé, all of which are Paris' closest suburbs. Paris' most sparsely populated quarters are its western and central office and administration arrondissements. The city's population is at its densest in its north and east arrondissements; its 11th arrondissement had a density of 40,672/km² (105,339/sq. mile) in 1999, and some of the same arrondissement's eastern quarters showed densities close to 100,000/km² (260,000/sq. mile) the same year. The city of Paris is much smaller than its urban area and metropolitan area. 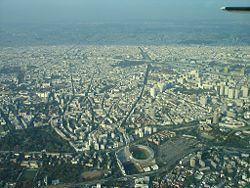 At present, the city's urban area (agglomeration) fills a ring of Paris' three neighboring départements - also known as petite couronne ("small ring") - and extends into an "outer ring" of four grande couronne départements beyond. These eight départements together complete the Île-de-France région. The Paris agglomeration or urban area (unité urbaine) covers 2,723 km² (1,051.4 mi²), or an area about 26 times larger than the city of Paris. Beyond this, the couronne peri-urbaine commuter belt region reaches well beyond the limits of the Île-de-France région, and combined with the Paris agglomeration, completes a metropolitan area (aire urbaine) covering 14,518 km² (5,605.5 mi²), or an area about 138 times that of Paris itself. View over the center of Paris, with the high-rises of the 13th arrondissement at right. The Paris agglomeration has shown a steady rate of growth since the end of the late sixteenth-century French Wars of Religion, except for brief setbacks during the French Revolution and World War II. Suburban development has accelerated in recent years, as with an estimated total of 11.4 million inhabitants for 2005, the Île-de-France région shows a rate of growth double that of the 1990s. French censuses, by law, ask no questions regarding ethnicity or religion, but do gather information concerning country of birth. From this it is still possible to determine that the Paris metropolitan area is one of the most multi-cultural in Europe: Over 20 percent were born outside France. The first wave of international migration to Paris started as early as 1820 with the arrival of German peasants fleeing the agricultural crisis in Germany. Several waves of immigration followed continuously until today: Italians and central European Jews during the nineteenth century; Russians after the revolution of 1917; colonial citizens during World War I and later; Poles between the two world wars; Spaniards, Portuguese and North Africans from the 1950s to the 1970s; North African Jews after the independence of those countries; and most recently, Africans and Asians in search of economic opportunity. The majority of these today are naturalized French without any distinction, in the name of the French Republic principle of equality among its citizens. Paris skyline, looking south from Montmartre. Paris is the capital of France, and therefore is the seat of France's national government. For the executive, the two chief officers each have their own official residences, which also serve as their offices. President of the Republic resides at the Elysée Palace in the VIIIe arrondissement, while the Prime Minister's seat is at the Hôtel Matignon in the VIIe arrondissement. Government ministries are located in various parts of the city - many are located in the VIIe, near the Matignon. The two houses of the French Parliament are also located on the Left Bank. The upper house, the Senate, meets in the Palais du Luxembourg in the VIe arrondissement, while the more important lower house, the Assemblée Nationale, meets in the Palais Bourbon in the VIIe. The President of the Senate, the second highest public official in France after the President of the Republic, resides in the "Petit Luxembourg," a smaller palace annex to the Palais du Luxembourg. France's highest courts are located in Paris. The Court of Cassation, the highest court in the judicial order, which tries most criminal and civil cases, is located in the Palais de Justice on the Ile de la Cité, while the Conseil d'État, which provides legal advice to the executive and acts as the highest court in the administrative order, judging litigation against public bodies, is located in the Palais Royal in the Ier. The Constitutional Council, an advisory body which is the ultimate authority on the constitutionality of laws and government decrees, also meets in the Palais Royal. Paris has been a commune (municipality) since 1834 (and also briefly between 1790 and 1795). At the 1790 division (during the French Revolution) of France into communes, and again in 1834, Paris was a city only half its modern size, but in 1860 it annexed bordering communes, some entirely, to create the new administrative map of the twenty municipal arrondissements which are still active today. These municipal subdivisions describe a clockwise spiral outward from its most central first arrondissement. 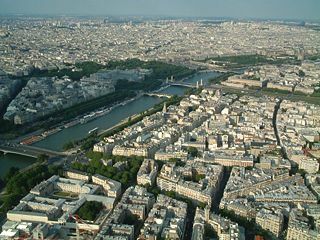 In 1790, Paris became the préfecture (seat) of the Seine département,, which covered much of the Paris region. 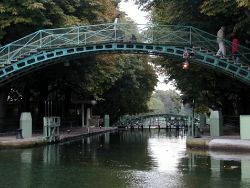 In 1968, it was split into four smaller ones: the city of Paris became a distinct département of its own, retaining the Seine's departmental number of 75 (originating from the Seine département's position in France's alphabetical list), while three new départements of Hauts-de-Seine, Seine-Saint-Denis and Val-de-Marne were created and given the numbers 92, 93 and 94 respectively. The result of this division is that today Paris's limits as a département are exactly those of its limits as a commune, a situation unique in France. Each of Paris's 20 arrondissements has a directly-elected council (conseil d'arrondissement), which in turn elects an arrondissement mayor. A selection of members from each arrondissement council form the Council of Paris (conseil de Paris), which in turn elects the mayor of Paris. 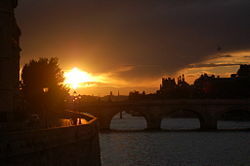 The Sun setting over the Seine. In medieval times Paris was governed by a merchant-elected municipality whose head was the provost of the merchants: in addition to regulating city commerce, the provost of the merchants was responsible for some civic duties such as the guarding of city walls and the cleanliness of city streets. The creation of the provost of Paris in the thirteenth century diminished the merchant Provost's responsibilities and powers considerably: a direct representative of the king, in a role resembling somewhat the préfet of later years, the Provost of Paris oversaw the application and execution of law and order in the city and its surrounding prévôté (county). Many functions from both provost offices were transferred to the office of the crown-appointed lieutenant general of police upon its creation in 1667. Paris' last Prévôt des marchands was assassinated the afternoon of July 14, 1789, during the French Revolution Storming of the Bastille. Paris became an official "commune" with the creation of the administrative division on December 14 of the same year, and its provisional "Paris commune" revolutionary municipality was replaced with the city's first municipal constitution and government from October 9, 1790. Through the turmoil of the 1794 Thermidorian Reaction, it became apparent that revolutionary Paris's political independence was a threat to any governing power: the office of mayor was abolished the same year, and its municipal council one year later. Although the municipal council was recreated in 1834, Paris spent most of the nineteenth and twentieth centuries, along with the larger Seine département of which it was a center, under the direct control of the State-appointed préfet of the Seine, in charge of general affairs there; the state-appointed Prefect of Police was in charge of police in the same jurisdiction. Paris, save for a few brief occasions, had no mayor until 1977, and the Paris Prefecture of Police is still under state control today. Despite its double existence as commune and département, Paris has a unique council governing both; the Council of Paris, presided over by the mayor of Paris, meets either as a municipal council (conseil municipal) or as a departmental council (conseil général) depending on the issue to be debated. Paris' modern administrative organization still retains some traces of the former Seine département jurisdiction. The Prefecture of Police (also directing Paris' fire brigades), for example, has still a jurisdiction extending to Paris' petite couronne of bordering three départements for some operations such as fire protection or rescue operations, and is still directed by France's national government. Paris has no municipal police force, although it does have its own brigade of traffic wardens. 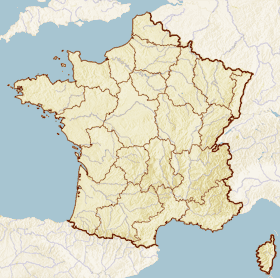 As part of a 1961 nation-wide administrative effort to consolidate regional economies, Paris as a département became the capital of the new région of the District of Paris, renamed the Île-de-France région in 1976. It encompasses the Paris département and its seven closest départements. Its regional council members, since 1986, have been chosen by direct elections. 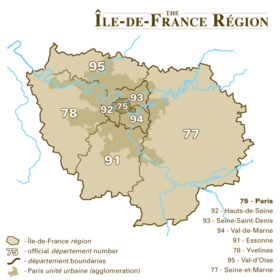 The prefect of the Paris département (who served as the prefect of the Seine département before 1968) is also prefect of the Île-de-France région, although the office lost much of its power following the creation of the office of mayor of Paris in 1977. Few of the above changes have taken into account Paris's existence as an agglomeration. Unlike in most of France's major urban areas such as Lille and Lyon, there is no intercommunal entity in the Paris urban area, no intercommunal council treating the problems of the region's dense urban core as a whole; Paris's alienation of its suburbs is indeed a problem today, and considered by many to be the main causes of civil unrest such as suburban riots in 2005. A direct result of these unfortunate events were propositions for a more efficient metropolitan structure to cover the city of Paris and some of the suburbs, ranging from a socialist idea of a loose "metropolitan conference" (conférence métropolitaine) to the right-wing idea of a more integrated Grand Paris ("Greater Paris"). Early in the ninth century, Emperor Charlemagne mandated all churches to give lessons in reading, writing and basic arithmetic to their parishes, and cathedrals a higher education in the finer arts of language, physics, music and theology. It was then that Paris, already one of France's major cathedral towns, began its rise to fame as a scholastic centre. By the early thirteenth century the île de la Cité Notre-Dame cathedral school had many famous teachers, and the controversial teachings of some of these was behind the creation of a separate Left-Bank Sainte-Genevieve University that would be the centre of Paris' scholastic Latin quarter best represented by the Sorbonne university. Twelve centuries later, education in Paris and the Paris region (Île-de-France région) employs approximately 330,000 persons, 170,000 of whom are teachers and professors teaching approximately 2.9 million children and students in around 9000 primary, secondary, and higher education schools and institutions. 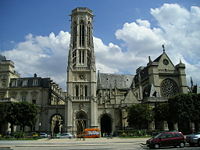 Paris Notre-Dame Cathedral was the first center of higher education before the creation of the University of Paris. The universitas, a corporation status granting teachers (and their students) the right to rule themselves independently from crown law and taxes, was chartered by King Philip Augustus in 1200. Many classes then were held in open air. Non-Parisian students and teachers would stay in hostels, or "colleges," created for the boursiers coming from afar. Already famous by the thirteenth century, the University of Paris had students from all of Europe. Paris's Rive Gauche scholastic center, or "Latin Quarter" as classes were taught in Latin then, would eventually regroup around the college created by Robert de Sorbon from 1257, the Collège de Sorbonne. The University of Paris in the nineteenth century had six faculties: law, science, medicine, pharmaceutical studies, literature and theology. The 1968 student riots in Paris, in an effort to disperse the centralised student body, resulted in a near total reform of the University of Paris. The following year, the formerly unique University of Paris was split between 13 autonomous universities ("Paris I" to "Paris XIII") located throughout the City of Paris and its suburbs. Each of these universities inherited only some of the departments of the old University of Paris, and are not generalist universities. Paris I, II, V and X, inherited the Law School; Paris V inherited the School of Medicine as well; Paris VI and VII inherited the scientific departments; etc. In 1991, four more universities were created in the suburbs of Paris, reaching a total of 17 public universities for the Paris (Île-de-France) région. These new universities were given names (based on the name of the suburb in which they are located) and not numbers like the previous 13: University of Cergy-Pontoise, University of Évry-Val d'Essonne, University of Marne-la-Vallée and University of Versailles Saint-Quentin-en-Yvelines. In Paris there is also the english-speaking Westminster Centre for International Studies, department of London's University of Westminster, as well as the The American University of Paris, a private higher education institution; and the The American Business School of Paris. The Paris region hosts France's highest concentration of grandes écoles, or prestigious centers of higher specialized education outside the public university structure. Note that (Prestigious public universities are usually referred to as grands établissements.) Most of the grandes écoles were relocated to the suburbs of Paris in the 1960s and 1970s, in new campuses much larger than the old campuses within the crowded City of Paris, though the École Normale Supérieure has remained on rue d'Ulm in the Ve arrondissement. The Paris area has a high number of engineering schools, led by the Paris Institute of Technology (ParisTech) which is composed of several colleges such as the École Polytechnique, École des Mines, Télécom Paris, and École des Ponts et Chaussées. Business schools are also many, including world-famous HEC, ESSEC, INSEAD, and ESCP-EAP European School of Management. Although Paris' former elite administrative school ENA was relocated to Strasbourg, the famous political science school Sciences-Po is still located in Paris' Left bank VIIe arrondissement. Also called classes prépas or simply prépas, these "prep" schools are a two or three year preparation leading to the grandes écoles (see above). Many of the best prépas are located in Paris. Key examples include Lycée privé Sainte-Geneviève, Lycée Louis-le-Grand, Lycée Henri IV, Lycée Hoche and Lycée Saint-Louis. Student selection is based on the school grades and the teacher remarks. Prépas attract most of the best students in France and are known to be very demanding in terms of work load and psychological stress. Inauguration of the T3 tramway line December, 2006. Paris's role as a centre of international trade and tourism has brought its transportation system many embellishments over the past centuries, and its development is still progressing at a rapid pace today. Only in the past few decades Paris has become the center of an autoroute system, high-speed train network and, through its two major airports, a hub of international air travel. 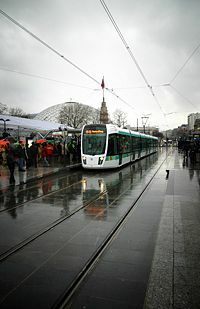 The public transit networks of the Paris region are coordinated by the Syndicat des transports d'Île-de-France (STIF), formerly Syndicat des transports parisiens (STP). Members of the syndicate include the RATP, which operates the Parisian and some suburban buses, the Métro, and sections of the RER; the SNCF, which operates the suburban rail lines and the other sections of the RER ; and other private operators managing some suburban bus lines. The Métro is one of Paris' most important methods of transportation. The system comprises 16 lines, identified by numbers from 1 to 14, with two minor lines, 3bis and 7bis, numbered thus because they used to be branches of their respective original lines and only later became independent. In October 1998, the new line 14 was inaugurated after a 70-year hiatus in inaugurating fully new métro lines. There are two tangential tramway lines in the suburbs: Line T1 runs from Saint-Denis to Noisy-le-Sec, line T2 runs from La Défense to Issy. A third line, in the city proper, T-3, between Pont du Garigliano and Porte d'Ivry, along the southern inner orbital road opened for use on December 15, 2006. Paris is served by two principal airports: Orly Airport, which is south of Paris, and the Charles de Gaulle International Airport in nearby Roissy-en-France, one of the busiest in Europe. A third and much smaller airport, at the town of Beauvais, 70 km (45 mi) to the north of the city, is used by charter and low-cost airlines. Le Bourget airport nowadays only hosts business jets, air trade shows and the aerospace museum. Paris is a central hub of the national rail network of high-speed (TGV) and normal (Corail) trains. Six major railway stations, Gare du Nord, Gare Montparnasse, Gare de l'Est, Gare de Lyon, Gare d'Austerlitz, and Gare Saint-Lazare connect this train network to the world famous and highly efficient Métro network, with 380 stations connected by 221.6km of rails. Because of the short distance between stations on the Métro network, lines were too slow to be extended further in the suburbs as is the case in most other cities. An additional express network, known as the RER, has been created since the 1960s to connect more distant parts of the conurbation. The city is also the hub of France's motorway network, and is surrounded by three orbital freeways: the Périphérique which follows the approximate path of nineteenth-century fortifications around Paris, the A86 autoroute motorway in the inner suburbs, and finally the Francilienne motorway, also known as the A104 (north) and N104 (south) (and N184), in the outer suburbs. Paris has an extensive road network with over 2000 kilometres of major roads and highways. By road Brussels can be reached in three hours, Frankfurt in six hours, and Barcelona in 12 hours. Paris in its early history drew its water from the Seine and Bièvre rivers. Later forms of irrigation were: a first-century Roman aqueduct from southerly Wissous (later left to ruin); sources from the Right bank hills from the late eleventh century; from the fifteenth century, an aqueduct built roughly along the path of the first; finally, in 1809, the canal de l'Ourcq began providing Paris with water from less polluted rivers away from the Capital. Paris would received its first constant and plentiful source of drinkable water in 1857, when, under Napoleon III's Préfet Haussmann, the civil engineer Eugène Belgrand oversaw the construction of a series of new aqueducts to bring water from distant sources to reservoirs built in the highest points of the Capital. The new sources became Paris' principal source of drinking water, and the remains of the old system, pumped into lower levels of the same reservoirs, were dedicated to the cleaning of Paris' streets. This system is still a major part of Paris' modern water supply network. Paris has over 2,400 km of underground passageways dedicated to the evacuation of Paris' liquid wastes. Most of these even today date from the late nineteenth century, a result of the combined plans of the Préfet Baron Haussmann and the civil engineer Eugène Belgrand to improve the then very unsanitary conditions in the Capital. Maintained by a round-the-clock service since their construction, only a small percentage of Paris' sewer réseau has needed complete renovation. The entire Paris network of sewers and collectors has been managed since the late twentieth century by a computerized network system, known under the acronym "G.A.AS.PAR," that controls all of Paris' water distribution, even the flow of the river Seine through the capital. Rome, Italy, 1956 is Paris' only sister city (Seule Paris est digne de Rome; seule Rome est digne de Paris / "Only Paris is worthy of Rome; Only Rome is worthy of Paris"). ↑ INSEE, Résumé statistique – Département de Paris (75) Retrieved October 17, 2016. ↑ GaWC, Inventory of World Cities Retrieved October 17, 2016. ↑ 4.0 4.1 4.2 (English) Paris, Roman City - Chronology www.paris.culture.fr. Retrieved October 17, 2016. ↑ (English) Paris, Roman City - The City www.paris.culture.fr. Retrieved October 17, 2016. ↑ Climatological Information for Paris, France Meteo France, August 2011. Retrieved October 17, 2016. ↑ INSEE, Commune de Paris (75056) - Dossier complet Retrieved October 17, 2016. ↑ (French) "Enquêtes annuelles de recensement 2004 et 2005" Government of France INSEE (PDF). Retrieved October 18, 2016. ↑ (French) "Enquêtes annuelles de recensement: premiers résultats de la collecte 2004" Government of France INSEE (PDF). Retrieved October 18, 2016. ↑ (French) "Histoire de l'immigration en France". Cité Nationale de l'Histoire de l'Immigration. Retrieved October 18, 2016. ↑ (French) "Improvising a Government in Paris in July 1789" Retrieved October 18, 2016. ↑ (French) "Le web des voyageurs franciliens". (STIF) Syndicat des Transports d'Ile-de-France. Retrieved October 18, 2016. Dunlop, Fiona. Fodor's exploring Paris. Fodor's exploring guides. New York: Fodor's Travel Publications, 2005. ISBN 1400015359. (French) Favier, Jean. Paris. Paris: Fayard, 1997. ISBN 2213598746. Higonnet, Patrice L. R. Paris: capital of the world. Cambridge, MA: Belknap Press of Harvard University Press, 2002. ISBN 0674008871. (French) Hillairet, Jacques. 2005. Connaissance du Vieux Paris. Rivages. ISBN 2869306482. Horne, Alistair. Seven ages of Paris..New York: A.A. Knopf, 2002. ISBN 0679454810. Hussey, Andrew. Paris: the secret history. New York, NY: Bloomsbury USA, 2007. ISBN 1596913231. Jones, Colin. Paris: biography of a city. New York: Viking, 2005. ISBN 0670033936. Spang, Rebecca L. The invention of the restaurant: Paris and modern gastronomic culture. Cambridge, MA: Harvard University Press 2000. ISBN 0674000641. This page was last modified on 15 January 2019, at 16:45.